Last Meeting – The last meeting of the regular season for these two teams was also the last game of the season for each team. That night, the V-Reds skated to a convincing 4-1 victory, outshooting the Aigles Bleus 36-25. Tyler Carroll led the scoring that night with two goals, while Antoine Houde-Caron and Dion Campbell each picked contributed a goal. Alex Quesnel picked up the lone marker for the Aigles Bleus. Number 1 hosts number 3 – With only two teams remaining, it is the #1 V-Reds who host the #3 UdeM Aigles Bleus in the AUS finals. The V-Reds, who had a first round bye made quick work of the UPEI Panthers, beating them in three straight games. The Aigles Bleus defeated the StFX X-Men in the first round of the playoffs, 2 games to one, and then defeated the SMU Huskies three games to one in the semi-finals. Head-to-Head – The V-Reds held the regular season edge of three games to one over the Aigles Bleus. This is the 24th meeting between these two teams in the AUS playoffs, the V-Reds hold a 16-4-3 record against the Aigles Bleus in the playoffs, but have not played them since the 2006-2007 season where they lost the final game and the AUS title in double overtime 3-2. They would meet the Aigles Bleus in the National gold medal game that year, defeating them by that same score of 3-2, this time in overtime with the winning goal being scored by Rob Pearce. 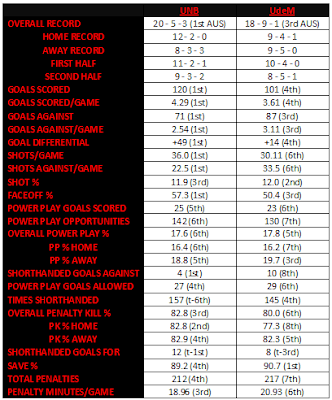 Below is a regular season stats comparison of these two teams. Who to Watch for on UdeM – Eric Faille (5G 2A), Marc-Andre Cote (2G 4A), and Dean Ouellet (2G 4A) lead the Aigles Bleus this post season in points. P-A Marion has been brilliant for them in net, allowing only six goals in six games and posting a record of 5-1-0 this post season. 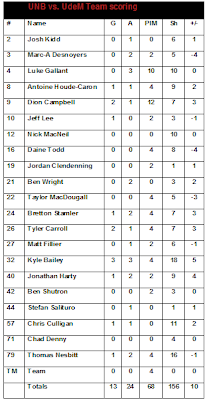 Below are the Aigles Bleus team stats against the V-Reds this season. Who to Watch for on UNB – The V-Reds are currently undefeated in the post season. Chris Culligan (2G 5A) and Shayne Weibe (2G 3A) lead the V-Reds in points while Travis Fullerton is 3-0-0 thus far with a GAA of 1.98 and a .920 SAV%. 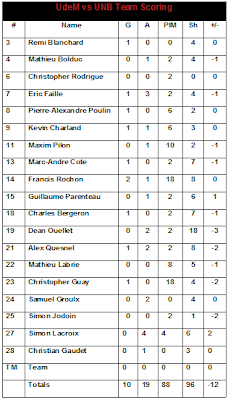 Below are the V-Reds team stats against the Aigles Bleus this season. For those of you that can't make it out to the game, it can be viewed as a webcast, listened to on CHSR FM 97.9, and following on UNBHockey on Twitter. Rogers TV will be covering the Thursday game as well.